There are four distinct types or classes of traction engines, namely: simple engines, duplex engines, tandem compound engines and cross compound engines. A simple engine has only one cylinder; a duplex engine, commonly called a double simple engine, has two cylinders of equal size placed side by side and connected with the same crank shaft by cranks placed 90 degrees or a quarter of a turn apart. A duplex engine, therefore, consists of two separate simple engines complete in every detail. A tandem compound engine consists of two cylinders, one large, the other small, placed end to end. The small cylinder is called the high pressure cylinder, the large one the low pressure cylinder. Steam first enters the small cylinder, and after doing its work therein is exhausted to the steam chest of the large cylinder at a much lower pressure and is then admitted to the large cylinder, where more of its energy is utilized before it is exhausted to the air. A cross compound engine has two cylinders of unequal size, placed side by side and connected to the same crank shaft by cranks placed 90 degrees apart, just as in the double engine. The small cylinder receives the steam first and is called the high pressure cylinder. After the steam has done a certain amount of work in the small cylinder, it is passed on to the large one, where it is made to do still more work, and is finally passed out at the exhaust at a low pressure. If the cylinder of a simple engine were eight inches in diameter, with a twelve-inch stroke, the area against which steam could act would be about fifty square inches. If steam at one hundred pounds pressure were admitted behind the piston throughout the whole stroke the total force driving it would be 50×l00 or 5,000 pounds. The amount of work done per stroke by such an engine would be equal to 5,000 foot pounds, since the distance the force moves is one foot. If the engine makes 200 revolutions per minute it will make four hundred strokes, and the total work done per minute is equal to 5,000×400 or 2,000,000 foot pounds. Since 33,000 foot pounds per minute equal a horsepower, the engine under consideration would develop 2,000,000 divided by 33,000 or 60-2/3-horsepower. Such an engine would be powerful, but it would be very wasteful of fuel and water because the steam at the end of the stroke would contain a great deal of energy that goes to waste in the exhaust and does no work. The best engines do not let the steam escape until a large part of its expansive energy has been turned into work, and consequently when the exhaust opens the steam escapes at a low pressure. In other words, a good engine uses the expansive power of the steam to perform work. In order to do this it is necessary to admit steam to the cylinder during only a portion of the stroke and then cut it off and allow it to expand behind the piston during the remainder. The means taken to accomplish this desirable result are to provide a valve having outside lap. Figure 31, shows a valve provided with both outside and inside lap. Outside lap governs the closing of the steam port or cut-off, and inside lap the closing of the exhaust port or compression. If the valve were a “square valve,” i.e., if it had neither outside nor inside lap, it would take steam and also exhaust it during the full stroke. As indicated above, such an engine would not be economical in the use of steam. The position of the eccentric using a square valve is 90 degrees ahead of the crank. If a valve having outside lap were used the throw of the eccentric would have to be larger than for a square valve in order to move the valve a distance equal to the lap, plus the port opening, and it would have to be placed enough more than 90 degrees ahead of the crank to move the valve at the beginning of the stroke a distance equal to the outside lap, plus the lead. The position of the eccentric for this condition relative to the crank is illustrated in Figure 32. The amount the eccentric is placed ahead of the 90 degrees position is called the angle of advance of the eccentric. This discussion applies to all plain slide valve engines and to link reverse engines, but not to engines fitted with reverse gears like the Woolf reverse, or gears of that class. After steam is cut off from the cylinder, it expands and pushes the piston to the end of the stroke, but with a constantly decreasing pressure. If the cut-off occurs very early the pressure at the end of the stroke may be almost nothing and theoretically the engine is doing the greatest possible amount of work with the least steam, and consequently the least fuel and water. This is clearly illustrated in the following diagrams in Figure 33. The length of the diagrams represents the stroke of the engine, and the height of the steam pressure, both to the same scale. The curved line shows how the pressure falls after cut-off. The whole figure represents the work done in the cylinder; the unshaded part, the work done before cut-off, and the shaded portion the work done after cut-off. It will be observed that the work done after cut-off, or during expansion, when the steam is cut off at either one-third or one-fourth stroke is more than it is before. 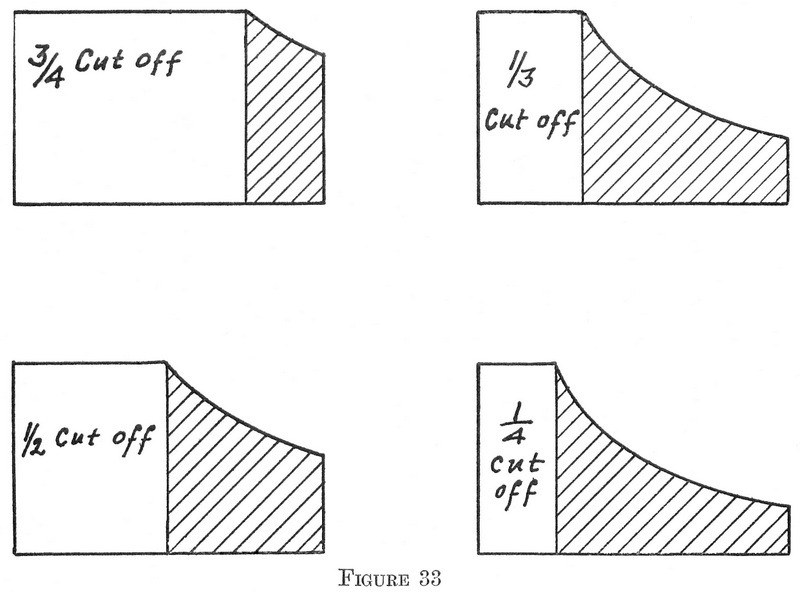 The diagrams in Figure 33 also show that at one-half cut-off, with one-half as much steam, theoretically eighty-six percent as much work can be done as at full stroke. At one-third cut-off sixty-seven per cent as much work can be done with one-third the steam, while at one-fourth cut-off with one-fourth as much steam, fifty-five per cent as much work is accomplished. Herein, then, lies the secret of using steam economically. Of course, such good economy can not be obtained practically, but practice shows that using steam expansively does result in greatly increased economy. In addition to an early cut-off, it is also desirable to close the exhaust port before the end of the stroke so that whatever steam remains in the cylinder may be compressed. Doing this, of course, increases the back pressure and reduces the useful work that the engine is able to do, but it is necessary to the good working of the engine for the following reasons. In all reciprocating engines, that is, engines in which a piston works back and forth in the cylinder, the piston, piston rod, cross head and connecting rod must be stopped twice during every revolution in order to start in the opposite direction. The combined weights of these parts is between one hundred fifty and two hundred pounds in an ordinary traction engine and they travel at a rate of about five hundred feet per minute. Such a heavy mass traveling at such a high rate of speed gathers a great deal of momentum, and if the piston did not meet with considerable resistance in compressing the steam, the task of stopping these moving masses and reversing their direction would come upon the crank pin. This would result in a heavy shock not only upon the crank pin but upon the main bearings and cross head pin, resulting in knocks or pounds at these places and difficulty through hot bearings. If the valve is given some inside lap, compression or cushioning of the exhaust helps bring the moving parts to rest and the stress comes upon the cylinder head instead of upon the bearings. The above discussion will explain why a badly set valve sometimes makes an engine pound at the crank pin, or main bearings, for if the valve is so set that there is no compression or cushion of the steam at one end of the stroke, the task of stopping the piston, cross head and connecting rod falls upon the crank pin and main bearings. The question is often asked, why are the cylinders of a compound engine of unequal size? This is easily answered by the aid of the accompanying diagram in Figure 34. 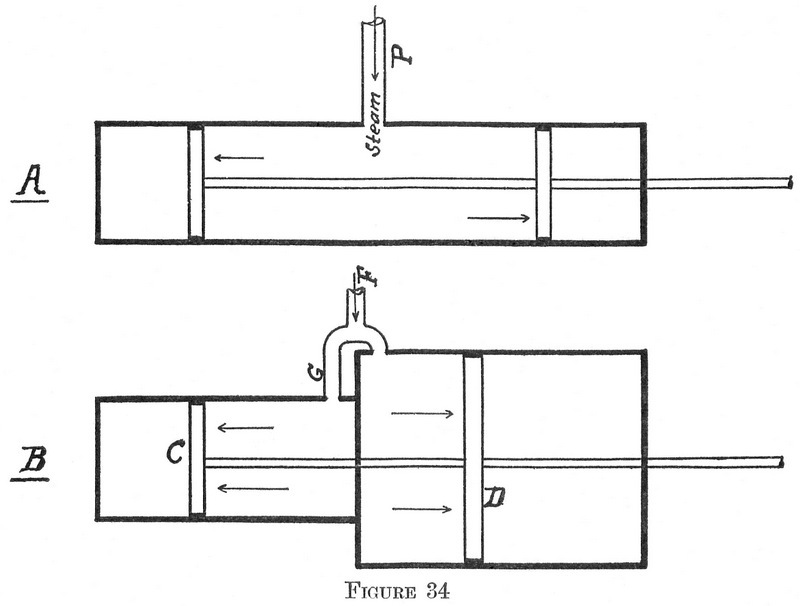 In diagram A, two pistons of equal size are secured to the same rod and steam is admitted between them through pipe P. Since both pistons are of equal size the total pressure acting toward the right is the same as that acting toward the left, and consequently there can be no motion. In Diagram B, where the pistons are of different size, the pressure per square inch on the right of C, and on the left of D, is the same. The total pressure on the large piston will be greater than on the small one and consequently movement will take place in the direction of the large piston. Whatever pressure there is on the small piston, however, will act as back pressure, and it is only the pressure on the difference in the area that produces motion. Suppose the area of the small piston were thirty square inches and the area of the large piston were fifty square inches. If steam at sixty pounds (per square inch) pressure be admitted to both cylinders through pipes F, and G, it will exert a total pressure on piston D, of 60×50 or 3,000 pounds (per square inch) acting toward the right and a back pressure on piston C, of 30×60 or 1,800 pounds (per square inch); the effective pressure, therefore; acting toward the right on the large piston is 3,000 minus 1,800 or 1,200 pounds (per square inch). If both pistons C, and D, were the same size, the steam admitted between them could not work, since the back pressure on one would exactly offset the forward pressure on the other. It must always be remembered that the forward pressure on the large cylinder is just about the same, or a little less, than the back pressure on the high pressure piston. The economy gained in using a compound engine arises largely from the fact that greater advantage can thus be taken of the expansive power of high pressure steam than with a simple engine. The power of an engine and its smoothness of running depend, to a great extent, upon the way the valve is set. If a plain slide valve is set with all the lead at one end, it will cut off steam earlier in one stroke and later in another, and, consequently, the engine will do more work on one stroke than on the other. This will cause the engine to use more steam than if the valve were set correctly and the power of the engine will be less. The use of more steam demands harder firing together with the use of more fuel and water. Besides, when a valve is too early on one stroke it will be too late on the other. Therefore on one stroke, compression will occur too early and on the other too late. This may cause compression to rise higher than the boiler pressure, and force the valve from its seat; then when the port opens, the steam compressed in the cylinder will escape to the steam chest and the valve will snap back on its seat, making considerable noise, while on the other stroke when there is little or no compression to take up the shock of reversing the moving parts there is apt to be a knock at the crank pin or cross head pin or in the main bearings. In view of the preceding discussion it will be seen that much depends upon how the valve is set. Every engineer should study the valve motion of his engine and be prepared to set it correctly in case it gets out of adjustment. The first thing to be learned is how to put an engine on dead center. An exact method of doing this with the use of a tram will now be described, step by step, and the directions should be followed in the order given. 1. Take up all lost motion in the cross head, connecting rod and main bearings. 2. Turn the fly wheel until the crank stands a little above center as shown in Figure 35. 3. Make a prick punch mark on the guides as at A, and another on the cross head B. Set a pair of dividers so that the points will fit into these two marks. 4. Make a prick punch mark on some convenient part of the frame as at C. Now, with one end of the tram D, in C, mark a point on the rim of the fly wheel or crank disc. Call this mark E.
5. Now turn the crank below the center, as shown by the dotted lines, until the point B, will come back to its original place and the points of the dividers will again fit into the two marks, A and B. The crank is just as far below center now as it previously was above center. 6. With one end of the tram in C, find another mark F, on the crank disc. 7. Now find a point G exactly midway between E and F and mark this with a prick punch. 8. Turn the crank in the direction the engine is to run until the tram will fit into the two marks C and G. The engine is now on dead center. The other dead center can be found in exactly the same way. After the marks are once established, with the same tram the engine can be quickly put on dead center again. It is a good plan for an engineer to make up a tram of stiff wire and find the proper marks C, and G, as described above, and then lay his tram away in the toolbox so that he can put his engine on dead center at a moment’s notice, thus being prepared to set the valve quickly in case it becomes necessary. 1. Put engine on dead center and scribe a mark across cross head and guides. Call this line A. 2. Put engine on other dead center and scribe another mark. Call this line B. 3. Disconnect connecting rod from crank. 4. Open the cylinder and push piston to extreme head end of cylinder, and measure from line A on guide to line A on cross head. 5. Push piston to crank end of cylinder and measure from line B on guide to line B on cross head. 6. If the measurements do not agree, either lengthen or shorten the piston rod where it enters the cross head, one-half the difference in the measurements. Another way to make sure of clearance is as follows. Put engine on dead center, disconnect the piston rod from the cross head, and push the piston to the extreme end of stroke. Now connect piston to cross head, and shorten the piston rod one-eighth of an inch; this will provide an eighth of an inch clearance at one end and will leave a little more or less than that amount at the other. At any rate there is no danger of the piston’s striking the cylinder head. The following directions refer to a plain slide valve engine without a reverse gear, and should be followed in the order given to insure success. 1. Take up all lost motion as described for putting an engine on center, and then take off the steam chest cover. 2. Turn the engine over by hand, and observe if the valve opens both the right hand and the left hand ports the same moment. If it does not do so, adjust it on its stem until it does. 3. Place the engine on dead center and then rotate the eccentric on the shaft in the direction the engine should run, starting from a position opposite to the crank, until the valve shows the proper lead on the side nearest the piston. 4. Secure the eccentric in this position by means of the set screws and turn the engine to the other dead center. The valve should have exactly the same lead, and it will have if the adjustment in item 2 was made correctly. 5. In case the lead is not the same, correct half of the error by moving the eccentric, and the other half by moving the valve on its stem. The valve will now be set correctly. The lead can either be increased or decreased an equal amount on both sides by moving the eccentric on the shaft. Moving the valve on its stem has the effect of increasing the lead on one side and of decreasing it an equal amount on the other. The amount of lead that should be given differs with different engines, and no general rule can be laid down that will be of any value, Some engines, even of the same make, require more lead than others. The best thing to do if the engine does not run smoothly is to make several trials until the correct lead is found for that particular engine. 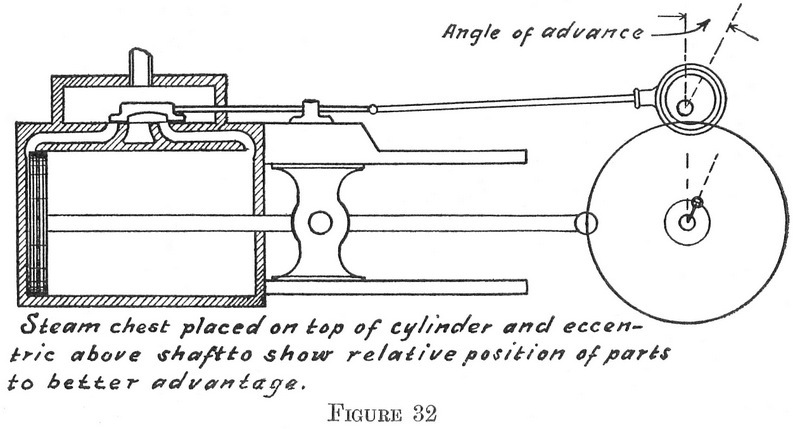 The correct position for the eccentric, relative to the crank, is shown in Figure 36, and the direction of rotation of the engine is shown by the arrow. 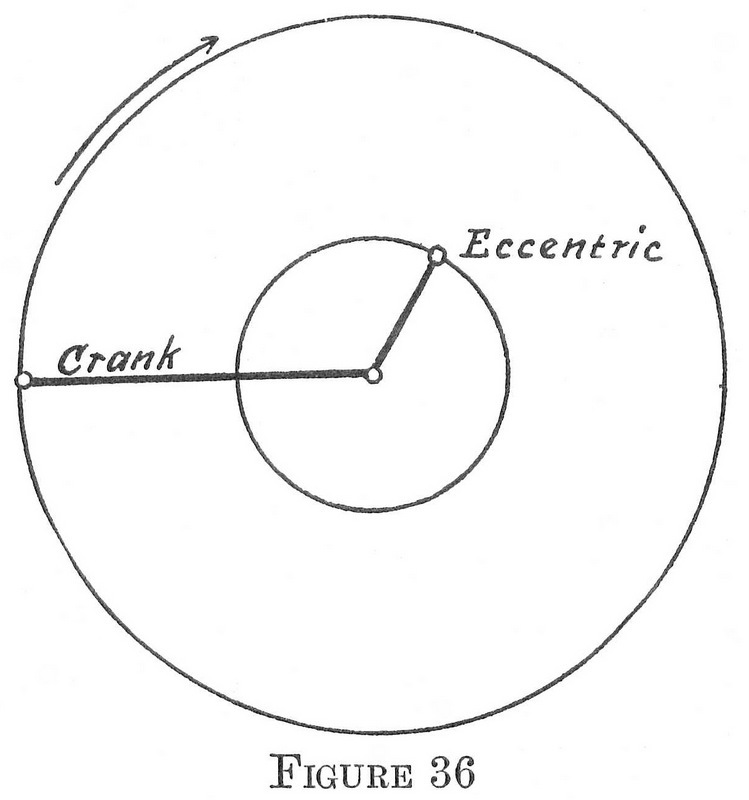 In order to reverse an engine of this kind, the eccentric must be placed as many degrees ahead of the crank in the opposite direction, as shown in Figure 37. These directions, it must be understood, apply only to a slide valve engine whose eccentric rod attaches directly to the valve stem without the intervention of a rocker arm. The position of the eccentric for the Woolf valve gear and the other reversing gears of a similar type, is entirely different and will be discussed on a subsequent page. The crank end of the connecting rod moves up and down past the center line of the engine during every revolution an amount equal to the length of the crank. This affects both the motion of the piston and the action of the valve in the following manner. In Figure 38, A-B, represents the stroke of the piston. For convenience, the connecting rod is supposed to be connected directly to the piston, thus dispensing with a cross head or piston rod. The point C, is midway between A and B. Now with a pair of dividers set equal to the length of the connecting rod, set one leg at C, and strike an arc across the crank circle, cutting the latter at D. This shows that when the piston has reached the mid point of its stroke that the crank has not made a quarter turn. When the piston travels from C to B, however, the crank will be at E. Therefore, during the first half of the piston stroke the crank does not travel as far as it does during the last half. This is due to the angle made by the connecting rod with the center line of the engine. 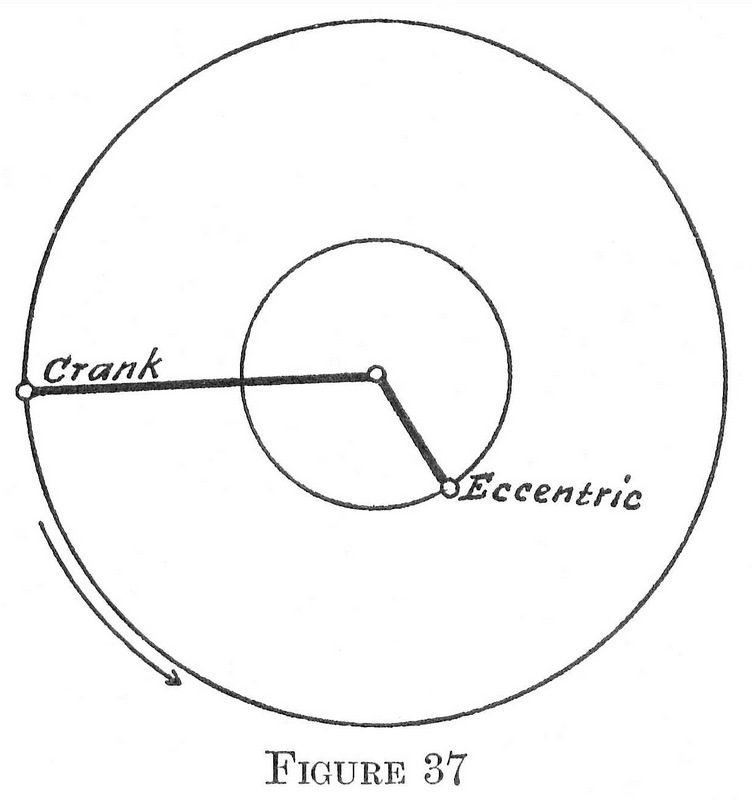 In all well governed engines the crank travels at a uniform rate of speed, that is, it takes the same time in making the first quarter of a turn that it does the second, therefore the piston must travel faster during the first quarter of a revolution of the crank than it does during the second quarter, starting from the head end of the cylinder. Now since the valve is driven from the shaft, it must keep exact time with the crank, but since the piston does not travel through equal distances for each quarter turn of the crank, it is evident that the valve and piston do not keep time with each other. If the valve cuts off steam at a certain point in the stroke on the forward motion, it will not cut off steam at the same point in the stroke on the return motion, a result due to the disturbing action of the angularity of the connecting rod. Consequently, in an engine such as we have been discussing, it is impossible to set the valve with equal lead and have equal cut-off. By making the lead unequal it is possible to make the cut-off equal for both the forward and return strokes, but this is seldom done in practice. The usual method, and in general the best satisfaction, will be obtained by setting the valve with equal lead even if the cut-off is not equal. Link reverse engines and reversible engines having a slotted eccentric, are affected in the same way as plain slide valves by the angularity of the connecting rod. There are some reversible engines, however, in which this difficulty is overcome.